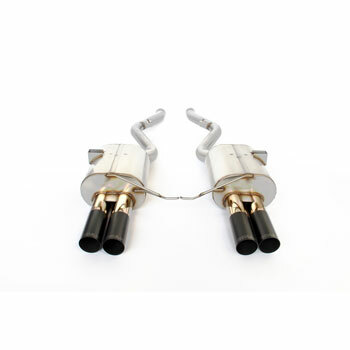 If you've been searching for a truly high performance rear muffler for your M3 Coupe or Convertible look no further. Special Note: This fits the M3 Coupe or Convertible only. The single channel dual exhaust is a full 10 lbs lighter than the stock BMW part. The Dinan Free Flow Exhaust is a sporty sounding exhaust at wide open throttle when you want it but also quite and civilized when you are at light throttle cruise. This is consistent with Dinan’s core philosophy of "Performance Without Sacrifice". One of the reasons you purchased your BMW is because of its level of refinement. You won’t ruin the refined characteristics of your BMW when you use Dinan performance products. This level of development takes time and is the reason Dinan is usually not the first company on the market but you will find it is worth the wait. Weight: BMW stock 57lbs. / DINAN Free Flow Exhaust 47 lbs. All Dinan exhausts are designed and hand built in California at the Dinan Headquarters. They are welded by hand using precise tools to ensure perfect fit. All are built from 20 gauge-304 stainless steel for strength and corrosion resistance.